Why Rent Tools When You Can Borrow? The Asheville Tool Library now has a carpet cleaner available for members to use! Asheville Tool Library members can now borrow this Bissell Big Green carpet cleaner for a whole week! Finally – no need to deal with 24 hour carpet cleaner rentals! As always, members pay no charge for borrowing tools from the Asheville Tool Library, but we kindly ask that you return the carpet cleaner as clean as possible – ready for the next library member to borrow. Asheville Tool Library Members can now borrow this Bissell Big Green carpet cleaner! 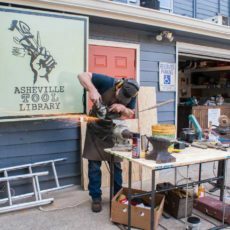 If you’re not already an Asheville Tool Library member, to become a member for a year, you can easily sign up with a donation of between $50 – $150 which allows you to borrow any of our tools for a week at a time. Your membership lasts for 365 days. Check out our Tool Inventory for a list of all the other tools we have available! Ready to pick up this tool? Swing by our new location at 55 Southside Ave. in downtown Asheville during our hours of operation. Note: The Tool Library does not provide the Cleaning Formula for this carpet cleaner. You must purchase that separately (unless another library member has donated a bunch to the library). The Asheville Tool Library is having a Free Tool Sharpening Event Saturday, Sept 1 from 11am-3pm. There will be AVLTL volunteers on site to sharpen your dull tools. The Free Tool Sharpening Event is open to everyone. Held downtown at the Asheville Tool Library, 55 Southside Ave. Copyright © 2019 Asheville Tool Library. Powered by WordPress. Theme: Ample by ThemeGrill.